I would like to share some of the tips which can help in ascertaining failure of a distribution/power transformer and also in repair of the same. SPM/TRE Engineers in particular must have these on finger tips. Tests the continuity of the winding (Healthy transformer must have continuity in all the phases but transformer with shorted windings can also have). Tests insulation resistance between windings and winding to earth. A healthy transformer should have resistance >0 in Mega Ohms. Any of the HV three terminals and any of the LV four terminals can be used for conducting the tests (If continuity in winding is available). We should never test charge a DTR/PTR if the IR values are 0 in any of the above three parameters. A healthy transformer will have approximately same resistance in all the three phase in HV winding though its value changes with the capacity of the transformer. LV winding resistance cannot be measured with a tong tester since it has less number of turns and higher size conductor when compared to the HV winding. Continuity of the LV winding can only be established. 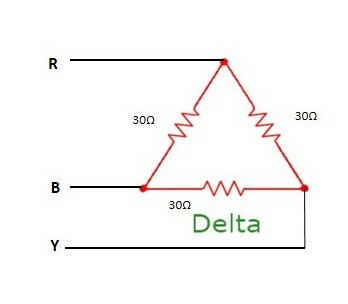 a) If the resistance of coils in one phase is 30 Ohms then for a healthy transformer resistance between RY, YB & BR terminals will be equal and 20 Ohms. b) If winding is opened/cut in one phase. i.e. resistance measured is double across one winding in case the winding is open and other two winding are healthy. c) In case two windings are open and one winding healthy. When resistance values are equal in all the HV phases the PTR/DTR may be OK. If resistance across one winding is double when compared to other individual winding it is clear that winding is open in one phase and PTR/DTR can be declared failed without going for other tests. If one winding is showing resistance and others are showing open (infinity) it can be suspected that two phases are open and one phase is healthy. Note: But it should be kept in mind that even opening of a jumper wire leading to HV bush rod may give similar value and can result in minor failure instead of two limb failure. So verification of jumper connection is to be done before declaration of a failure. The failure in windings causes erosion of winding material which results in collection of gas in bucholz relay and transformer tank. If the DTR/PTR is still found healthy in above tests it can be subjected for further test like 1. ratio tests, 2. short circuit test, 3. magnetic balance test/arranging LT phase test supply to take final decision for declaration of failure/healthiness. LV & HV windings of a power transformer and LV winding of a failed distribution transformer will be generally reinsulated during repairs. Conductor to the extent of damaged portion will be replaced for PTRs and damaged HV winding coils will be replaced for distribution transformers. For rewinding of coils after re-insulation the winder generally takes into consideration the dia-metre and height of the damaged coil. But the winder may endup with a coil with less/excess number of turns and slight variation in height and dia-metre. Hence the AE/Winder should have the knowledge of minimum size of conductor, number of turns, number of conductors any capacity distribution/power transformer should have to deliver the rated output. Hence 100 KVA aluminum distribution transformer should have a minimum of 78 turns to have voltage/turn within limits. Number of turns in HV winding can be easily arrived by formula. Number of turns in HV winding = voltage ratio X Number of turns in LV winding. The size of the conductor depends on the current density of the material used for winding. Current density that can be allowed is. The above values are minimum size of cross section the conductor that can be utilized for replacement of damaged conductor. However higher size can be utilized provided minimum clearances are maintained between windings and core. If the dia-metre of the conductor comes more than 3.5mm dia, rectangular shaped strip to be used since strip has better surface length and more space factor than that of a round conductor. Hence for distribution transformer round conductor is used for HV windings and rectangular strip is used for LV windings. The dia-metre of the HV conductor being used for a 100 KVA is 1.6mm i.e. 16 SWG. Selection of size of rectangular strip of equal cross section is more importance since we can have many sizes for the same cross section. In general for all practical purposes for easy handling. Width of the strip is to be more than double the depth of the strip. From the above it is evident that more number of conductor in parallel can be utilized instead of higher sized single connector. Utilization of multiple conductors results in more flexibility during winding and also decreases skin-effect since surface length of conductor is more with multiple conductors. For 100KVA aluminum transformer LV conductor of 88 sqmm cross section can be had by having two conductors of size 44 sqmm each in parallel. Depth of strip should be minimum a 2.25mm and width can be calculated to accommodate required number of the LV turns within the height of LV coils in single layer or double layer. Thank u sir .U have provided very useful information to the all field engineers. Sir, Testing of DTRs data provided by you is very useful for us in Repairing of DTRs at SPM Sheds and the failure of DTRs can be minimized by these testings and we will use the data for testing of DTR at Narayanpet SPM. Thank u sir. It will be helpful to farmers and prevents repeated failures. how can i finding phase sequence RYB There was no colour coding.